As of recent data, an insane 81% of the United States population alone is active on social media. When it comes to the global population, usage is expected to reach 3.02 billion in terms of monthly active users within the next 2 years. To really break this down into a more digestible picture – that’s approximately one-third of the Earth’s population. There’s no denying that social media marketing is absolutely essential to the success of any company in today’s world, and in order for your business to remain effective, you must stay ahead of the curve. So, what exactly does the landscape of social media marketing look like for the coming year? If that’s a question you’re interested in, then you’ve come to the right place. The purpose of this article is to expound upon the biggest projected trends in social media marketing for 2019. Some of these trends you will already be somewhat familiar with, as they were also some of the biggest trends in 2018. However, there are definitely some new kids on the block to keep your eye on. So, take a look, and get prepared. Did you know that the number of daily Facebook Live broadcasts has literally doubled year-over-year since 2016? 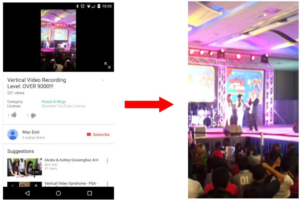 Live broadcasting burst onto the social media marketing scene with YouTube not too long ago and already, it seems like we can barely remember a life without it. Live content serves as an amazingly useful tool when it comes to your online marketing efforts because it helps increases transparency. Point blank – it’s personal, it’s authentic – and if recent data has shown anything, it’s that your consumers are interested in genuine brands that they can truly connect with and trust. Live content is also a great way to harness the all-powerful FOMO (fear of missing out). Broadcasts give your brand the opportunity to dole out limited offers for those who tune in such as giveaways, discounts and other special, limited-time only forms of promotion. There’s a massive audience out there when it comes to live content, and the numbers have shown it is only going to continue to grow in 2019. Augmented reality sprang into relevancy on the social media scene primarily thanks to the platform Snapchat, who introduced their fun and funky filters, making them perhaps an all-too familiar fixture in our everyday lives. According to a recent B2C article, AR and VR markets are projected to “surpass $298 billion” within the next 4 years. 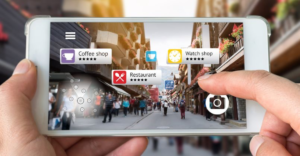 AR presents a unique opportunity for businesses to stand out and differentiate their brand amongst the masses. Think branded games, filters, product trials (such as IKEA’s furniture app), interactive content or ads – investing in this technology is a great way to engage your audiences in a personable manner and spread awareness about your business in 2019. Let’s face it – the majority of brands are still reeling from the recent algorithmic updates many social platforms have made (especially Facebook and Instagram) for their news feed section. Back in 2012, organic page reach was at an all-time high of 15%. Fast forward to 2018, and 5% is above average. 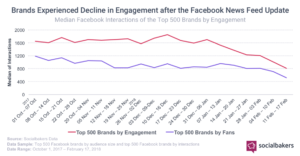 Whether the platforms are pushing brands to boost ad spend under the guise of pleasing their audiences or not, the end result is that more brands are going to be placing a heavier focus on organic reach in 2019 in order to offset the toll that social media marketing spend is taking on their budgets. There used to be a time when vertical videos were absolutely frowned upon due to their low resolution, “amateurish” style. However, with the meteoric rise of mobile phone usage for practically any and everything we can think of in our daily lives, this sentiment is long gone. You may already be well-aware of the importance of video marketing at this stage in your career, but are you certain you’re doing it right on social media? According to a recent MOVR Mobile Overview Report, researchers found that a whopping 94% of smartphone users hold their phones vertically when watching video, regardless of whether or not that video was intended to be watched in the horizontal position. Postcron recently found that advertisers who utilized vertical video to promote their brands ended up with better results on both views and engagement than those who didn’t. For example, Wibbitz, a platform designed to create automated videos found that they received a 130% increase on views and an insane 4x more engagement on social media by simply using vertical videos over horizontal ones. Millennials who? The past few years the millennial generation has taken up most of the spotlight. 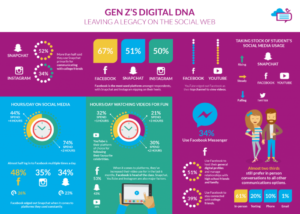 However, expect 2019 to bring focus on the new kids on the block: Generation Z. Who are they? The first generation that grew up on social media and thus, the most social media literate generation as of yet. They are also the youngest generation beginning to enter the workforce and will make up a whopping 40% of all customers by 2020. As a result, these guys are a key demographic to begin targeting (if you haven’t already) in 2019. So, what do they want? Genuine relationships with authentic brands. They want interactive content and crave “in the moment consumption”. Thing gamification of stories, augmented reality, live video – pretty much all of the trends we’re discussing for 2019. 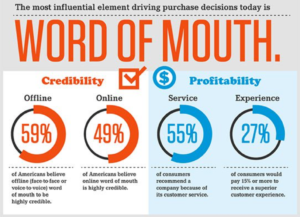 Word-of-mouth has always been an effective form of marketing for brands. But do you fully understand how vital it is to your company’s success? According to a recent Neilsen report, “92% of consumers believe suggestions from friends and family more than advertising” – and that’s not all. The company also found that “74% of their consumers identify word of mouth as a key influencer in their purchasing decisions”. So, why then are only 33% of businesses actively seeking out and encouraging/collecting reviews? Couple these statistics with the fact that organic reach on social media is at an all-time low, and you’ll quickly see why your business can’t afford to not have word of mouth marketing on your agenda for 2019. Ah, the all holy union of social media and television. TV networks and rights holders alike are beginning to see the value in social sharing in order to both monetize engagement and increase viewership. Way back in 2010 social TV was named one of the top 10 most important emerging technologies by MIT Technology Review. Fast forward to 2019 and we’ve seen everything from Twitter Amplify, Facebook Suggested Videos, Snapchat Discover and Instagram’s IGTV dominating the social platforms. Many of these platforms are looking to compete with traditional television – and who could blame them when all of the major broadcasting organizations are pitching in for some time? 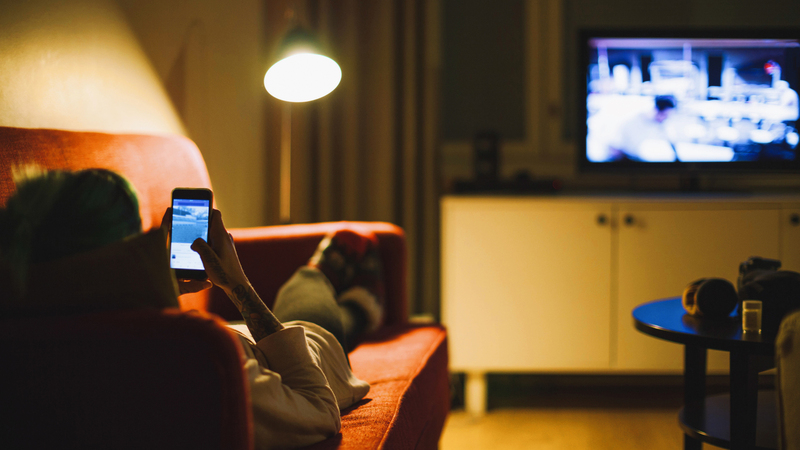 According to Social Report, research shows that internet will be catching up to television in terms of hours watched in 2019. This same study found that people will be projected to spend 2.6 hours a day online and 45 minutes of their total online time watching mobile video alone. Are you investing your ad dollars properly? Did you know that the number of Facebook Messenger users is projected to increase to 139.2 million in 2020? This is an astounding increase from just four years ago where usage topped out at 64.9 million. Regardless, that’s a lot of millions. 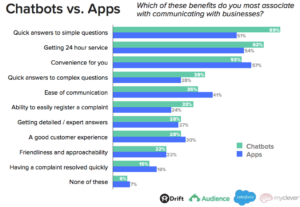 According to CMS Connected, messenger apps such as Facebook’s surpass traditional platforms such as email when it comes to consumer engagement. Recent research found the average open rate on messenger was a whopping 84.3% as opposed to email’s 22.87%. Even better, the average messenger click-through rate was 28.3% in contrast to email’s 3.26%. Messenger apps present a unique opportunity for businesses to efficiently connect with their social media audience. Let’s be honest, not every user on an app such as Facebook messenger is looking to purchase a product, but for those who have already expressed interest by let’s say, visiting a company’s social page, businesses can harness the power of chatbot technology by initiating conversations and essentially cultivating leads. Doing so has additionally been shown to increase engagement through the course of the customer journey. With an increase in adaptation for this technology on the part of brands comes a decrease in negative perception from consumers. A recent LivePerson study found that just 19% of individuals surveyed had a negative experience with chatbot technology. The other 81% were content with their experience given their needs were met. 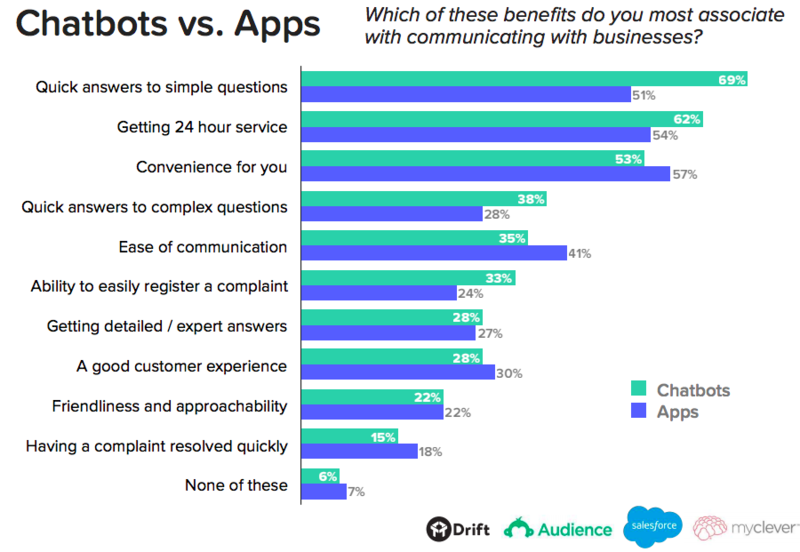 In 2019 it is expected that more brands will begin to better hone their online customer service practices and make better use of chatbot technology. Why wouldn’t they? The technology can be easily developed and offers businesses the opportunity to efficiently and effectively close sales and meet the needs of their social media audiences. So, there you have it. The latest trends in social marketing for 2019. As a company attempting to remain competitive in today’s market, you already understand how essential it is to remain well-versed in the social media landscape. This is why we are consistently working hard to bring you the latest and most up-to-date information on social media marketing practices. It’s our hope that you’ve found this article insightful and that you are able to gain several takeaway points for the purpose of implementing into your 2019 strategy. So, what are you waiting for? You’ve got the world at your fingertips. Get out there and knock em’ dead. Which social media marketing trend do you feel you have the best bet at leveraging in 2019? Let us know your thoughts in the comments below!